Harga Motor Piaggio Gilera Fuoco here is the average price of the Big City Like: Jakarta, Bandung, Medan, Surabaya, Semarang, Makassar, Denpasar from various stores and authorized Dealers. Technology and the framework of the two similar (Fuoco & MP3), even for the two front wheels. Carrying the four-stroke engine, four-valve, EFI 492.7 cc which also has a base in common on engines Piaggio Gilera Fuoco and Gilera Nexus 500 is also presented by KSN. Ii the middle of the swift Japanese motorcycle products, Italian motorcycles trying to break through the market. 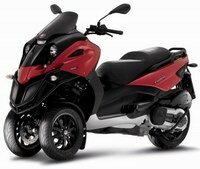 Throughout January-February 2010, the Piaggio Gilera Fuoco products sold around 70 units.